Elections have been underway for the new European Parliament. People (approximately 375 million) from twenty-seven countries have or will vote soon, and tomorrow Hungarians will go to the polls to elect their 22 MEPs. Compared to our neighbors, Hungarians seem pretty interested in the elections. According to the Central European Opinion Research Group poll, 60% of Hungarians claim they will “certainly” vote tomorrow, compared to people in Poland, Slovakia, and Czech Republic, who are in the 40% range. On a slightly troubling note, after the socialists, a radical party of far right nationalists led strangely by woman who has been linked to anti-Semitism and anti-Roma violence has been gaining ground. They will most likely win a seat in the EU parliament. I won’t say anymore about her because I don’t know enough, plus when looking up info about her and her politics I read the SINGLE MOST SEXIST article in the British Telegraph I have ever read in my life about a woman politician. For all of you language gurus out there, take a look at this little gem. As an outsider I don’t know exactly how to make sense of it, probably in much of the same way a non-American would try to digest our election madness. What I do know is that a lot of Hungarians are really unhappy. As I see it, the people are trapped between the old and new system. Unlike some neighbors (Poland immediately comes to mind) that have taken to a “western-system” much more smoothly in the last twenty years, Hungarians haven’t quite turned it around. It’s not the people’s fault, but the government that has instituted a system, which finds Hungarians paying some of the highest taxes in all of Europe yet receiving the least amount of social and economic benefits. The system is broken. Their ad reads “Who will be the third power?”. You can see in the poster three “regular” guys, democrats, including the one on the bottom left who is the famous Hungarian footballer, Ferenc Puskás, and then the extreme far right guy. This ad is attacking the far right party, Jobbik, who actually will gain a seat in the parliament, rather than the liberals. Oh well. Sorry average guy. The next ad is from Jobbik, who are the extreme right-wing group gaining a lot of attention recently. 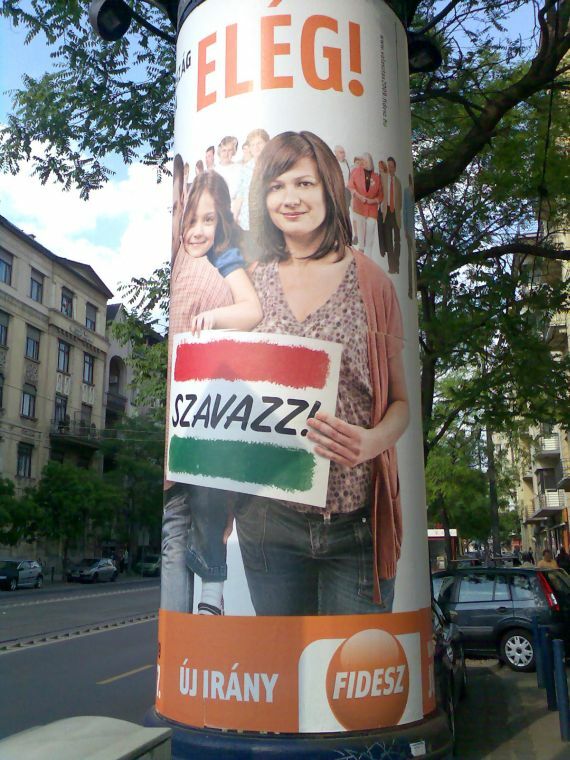 Their name stands for a “movement for a better Hungary”, which of course means the following: stopping the massive immigration of groups unfit for social assimilation, compulsory instruction of ethics and religion in elementary and secondary schools, proclaiming the Árpád-striped flag as an all-Hungarian symbol, setting up a special organisational unit within the police force to prevent gipsy crime, and establishing a National Guard organised on a voluntary basis of regional defence. The text means “We will grow up. We will get stronger.” eeek! Just recently, Jobbik’s sloga “Hungary belongs to the Hungarians” was deamed unconstitutional. There’s a lot of history that goes into this one, and I’ll have to address it at another time. Or you can refer back to here or here. The third ad is from FIDESZ, the large conservative party, which will most likely take over after the next elections and whose leader, Viktor Orbán, said today that the EU elections will RESOUND LIKE THUNDER against the the socialists. It’s getting exciting now! The text means: Elég: Enough! & Szavazz: Vote! So there you go. We’ll see what happens tomorrow. 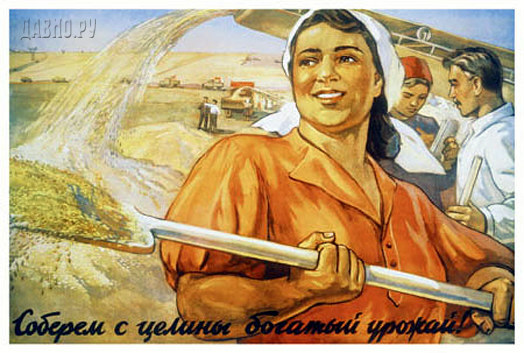 The top part of the SZDSZ ad (construction guy vs. militant) is an official SZDSZ product. 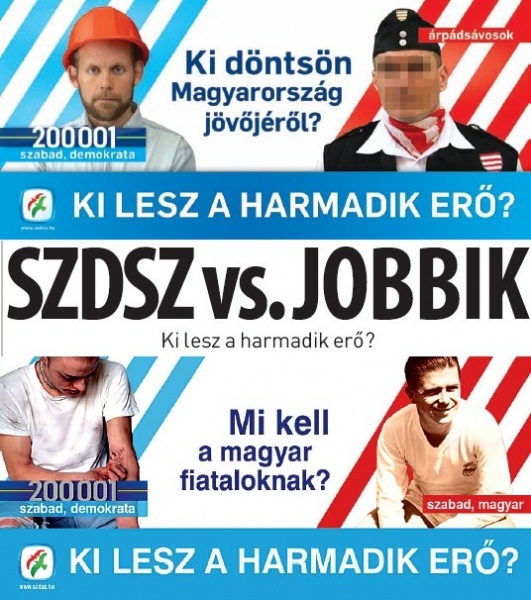 You can view two more similar ads at http://www.200001.eu/index.php?view=doc;16 Each ad higlights the contrast between the free (szabad) and democrat (demokrata) average guy and the scary guy representing Jobbik. The bottom part, however, is an anti-ad. The liberal party’s junkie is compared to the greatest soccer (football) player, Ferenc Puskas (1927 – 2006), Hungary has ever produced. I guess he’s supposed to represent the conservative, sentimental and cultural values that Jobbik would like to be seen standing for.